We are into offering a premium range of Ammonia Cylinders. 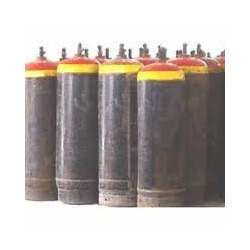 Offered Ammonia Gas Cylinders are equipped with best quality valves that are very easy to open and close. Our ammonia cylinders are in adherence to the quality issued by state bureau of quality and our gas cylinders are covered by "safety supervision regulations for gas cylinders". Under strict rules and regulation, we manufacture Ammonia Cylinders that are widely demanded for various industrial applications that includes heat-treating processes such as Nitriding, Sintering, Carburizing and furnace brazing. Further, these ammonia cylinders are also used as a refrigerant, in pH neutralization, chemical manufacturing, pharmaceuticals and even water treatment. We are manufacturing the Ammonia gas for various industrial purposes. Looking for Ammonia Cylinders ?